Spacer Bars and Tubes are endlessly useful, functional, decorative .. and can add endless possibilities to your ultimate design. They come in all designs .. from the very ornate to the super-simplistic. At its very basic functionality, it "spaces" out your beads. You may be using really expensive beads and you don't need or can't afford to fill out the entire design with the expensive beads. Using spacers, you can space them out ~ saves you money without marring your finished look. 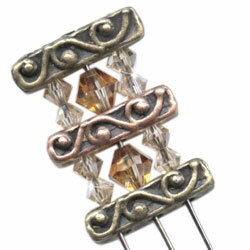 Most artisans use the look of their chosen spacers to ADD to the distinctive look of their creations. They are most often used in jewelry making for bracelets, necklaces, etc. However, don't limit yourself to just jewelry. It is very cool to use your spaces in your card, scrapbooking, altered book, etc. projects by adhering it with a good glue. After it completely dries, then put your favorite fiber or thin ribbon, silver coil, etc. thru it and embellish with small charms or seed beads for a different look.